It’s widely thought that human language evolved in universally similar ways, following trajectories common across place and culture, and possibly reflecting common linguistic structures in our brains. But a massive, millennium-spanning analysis of humanity’s major language families suggests otherwise. Instead, language seems to have evolved along varied, complicated paths, guided less by neurological settings than cultural circumstance. If our minds do shape the evolution of language, it’s likely at levels deeper and more nuanced than many researchers anticipated. 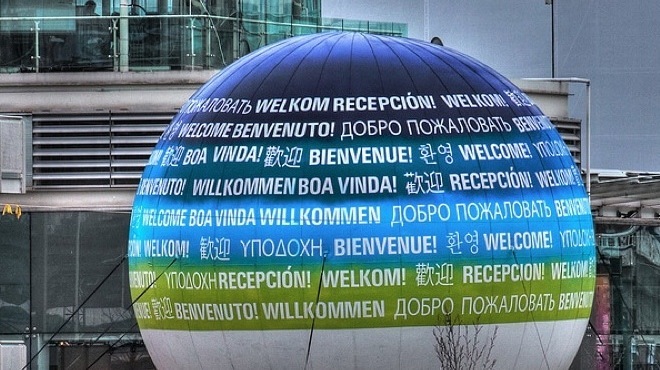 How languages have emerged and changed through human history is a subject of ongoing fascination. Language is, after all, the greatest of all social tools: It’s what lets people share and cooperate, divide labor, make plans, preserve knowledge, tell stories. In short, it lets humans be sophisticated social creatures. Such a system would account for why, of the nearly infinite number of languages that are possible — imagine, for instance, a language in which verb conjugation changes randomly; it is possible — relatively few actually exist. Our brains have adapted to contain a limited, universal set of switches. A limited set of linguistic universals is exactly what was described by the late, great comparative linguist Joseph Greenberg, who empirically tabulated features common to language. He made no claims as to neurological origin, but the essential claim overlapped with Chomsky’s: Language has universals. If you speak a subject-verb-object language, one in which “I kick the ball,” then you likely use prepositions — “over the fence.” If you speak a subject-object-verb language, one in which “I the ball kicked,” then you almost certainly use postpositions — “the fence over.” And so on. That’s what Dunn, along with University of Auckland (New Zealand) computational linguist Russell Gray, set out to test. Unlike earlier linguists, however, Dunn and Gray had access to powerful computational tools that, when set to work on sets of data, calculate the most likely relationships between the data. Such tools are well known in evolutionary biology, where they’re used to create trees of descent from genetic readings, but they can be applied to most anything that changes over time, including language. In the new study, Dunn and Gray’s team created evolutionary trees for eight word-order features in humanity’s best-described language groups — Austronesian, Indo-European, Bantu and Uto-Aztecan. Together they contain more than one-third of humanity’s 7,000 languages, and span thousands of years. If there are universal trends, say Dunn and Gray, they should be visible, with each language family evolving along similar lines. 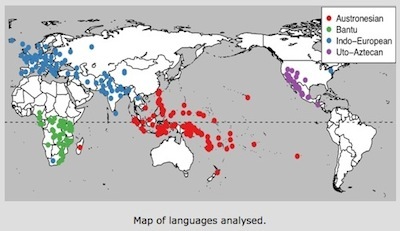 In one representative example of divergence (diagram above), both Austronesian and Indo-European languages that linked prepositions and object-verb structures (“over the fence, ball kicked) tended to evolve preposition and verb-object structures (“over the fence, kicked ball.”) That’s exactly what universalism would predict. Such differences might be eye-glazing to people unaccustomed to diagramming sentences, but the upshot is that the two language families took opposite trajectories. Many other comparisons followed suit. “The things specific to language families trumped any kind of universals we could look for,” said Dunn. Instead of a simple set of brain switches steering language evolution, cultural circumstance played a role. Changes were the product of chance, or perhaps fulfilled as-yet-unknown needs. For whatever reason, “the fence over, ball kicked” might have been especially useful to Indo-European speakers, but not Austronesians. There is, however, still room for universals, said Pagel. After all, even if culture and circumstance shapes language evolution, it’s still working with a limited set of possibilities. Of the six possible combinations of subject, verb and object, for example, just two — “I kicked the ball” and “I the ball kicked” — are found in more than 90 percent of all languages, with Yoda-style “Kicked I the ball” exceedingly rare. People do seem to prefer some structures. “What languages have in common is to be found at a much deeper level. They must emerge from more-general cognitive capacities,” said Dunn. “This can be applied to every level of language structure,” he said.